You are here: Up-daily » Entertainment News » Not Handled With Care! Rogue Singer Goes Online About Dissatisfaction with Philippine Airlines! Not Handled With Care! Rogue Singer Goes Online About Dissatisfaction with Philippine Airlines! If the trust on keeping that responsibility is broken, it is no surprise that we would be frustrated about it. This is what happened to Jeri Vega Oro, singer of Rogue, an all-girl local Pop rock band, who shared her frustrations on her social media account about the handling of the casing for her musical instrument used in gigs. 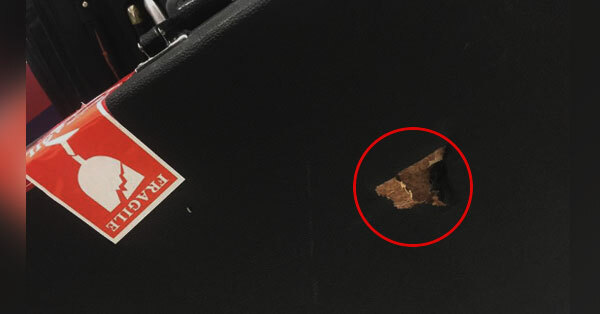 Photos were taken of the damage in the hard casing, with a Fragile label sticker ironically placed on its surface. Miss Oro called out Philippine Airlines, the airline who was entrusted for the case during one of her recent flights with them. The singer stated she was grateful the damage didn’t get to the contents aside, which would pose a lot more problems for the musician in her upcoming ventures and gigs. There has been no word or further updates on the compensation for Miss Oro’s case, but the singer has updated her social media as of recent with another emotionally fueled post tagged to the airline, as well as with another airline, AirAsia, sharing a video of the AirAsia crew and their improper handling of passenger luggages.